Each fall, a Sunday afternoon takes on a whole new meaning as two teams take the field prepared to participate in 60 minutes of battle against each other. 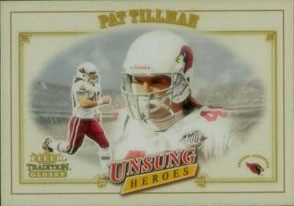 Following the events of September 11, 2001, Pat Tillman did something no man ever has or will probably ever do again: he walked away from millions of dollars to play a game compared to warfare to participate in actual warfare. As a society we are fascinated with heroes, idols, and those who are capable of doing things we ourselves cannot do. I cannot run a 40-yard dash in under 4.6 seconds and I have no idea what I bench press. 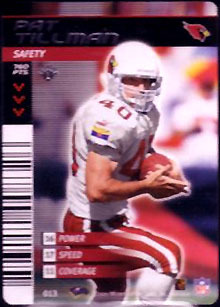 I don't know how to call a non-Madden audible, nor I am not capable of a "pick-six," therefore, I cannot do the things an NFL player can, the things Pat Tillman could do. Pat Tillman was one of the NFL's elite safeties and had a chance to earn millions of dollars in a game very few people are capable of playing. However, Tillman was compelled to do something the everyday man could do, something any healthy 20-something is capable of doing—volunteering for the armed services. 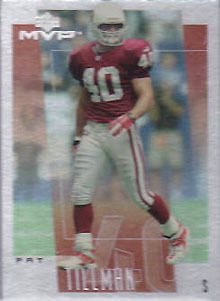 In 2002, Tillman was one of the NFL's most sought-after free agents. Instead of signing a million-dollar contract with the Cardinals, he signed with United States Army, believing that the same tools that allowed him to excel on the football field would be better used serving his country. In 2004, Tillman was killed by friendly fire during a training drill. The circumstances of Tillman's death are not nearly as important as the circumstances of Tillman's life. At the time of his death, Tillman and his brother Kevin, a former minor league baseball player, were Army Rangers, a role designated to the bravest of the brave, the best of the best. That is how most will remember Pat and the legacy he left behind. 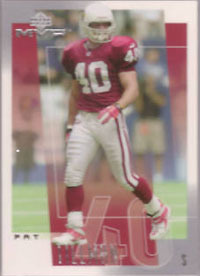 2001 Fleer Base, Glossy & Traditional Pat Tillman RC 3 Card Lot PSA 10 Gem Mint!